For details on minor releases since FishEye 1.5, see the FishEye Changelog. 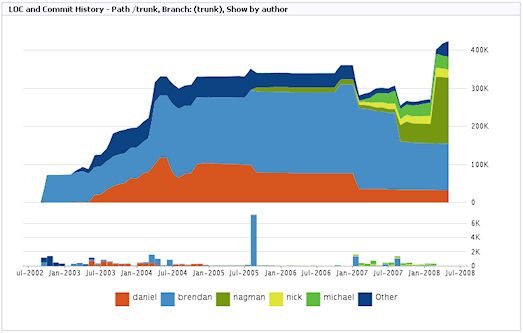 FishEye release 1.5 is a major release that adds the ability to present historical, per-author line count information. This new suite of graphs show how much each user has contributed to the code base, over time. You can now download FishEye from here. If upgrading from a previous version, please follow the Upgrade Guide. Statistics for lines of code is now broken down per-author, providing an all-new level of detail. This allows you to see how many lines of code were contributed to your project by each author, over time. This requires changing a setting and re-scanning existing repositories. See the FishEye upgrade guide for more information. 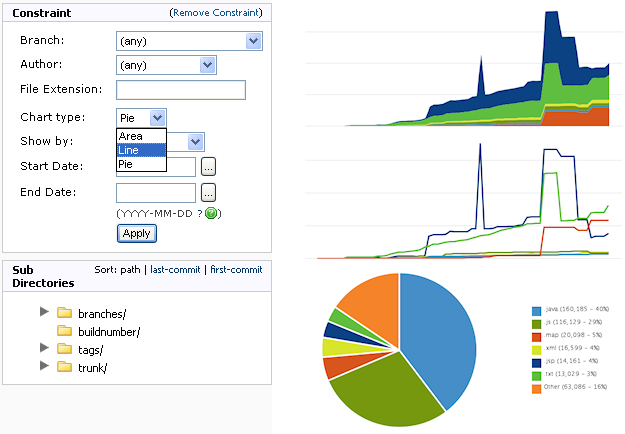 The line graphs in FishEye have been improved, providing a better view of lines of code statistics from your project, as well as showing how this has grown. You can now customize the content and appearance of email notifications that are sent to FishEye users. For example you can append a legal disclaimer, alter the subject line or provide custom header text for all messages.